With World Cup fever still ravaging the globe, it was only a matter of time before the world turned into one big soccer game. 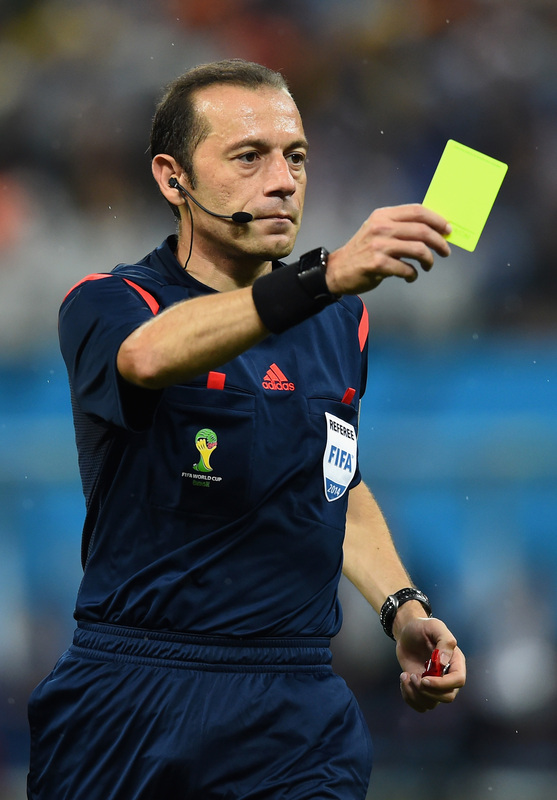 It's no surprise, then, that one referee has taken to giving out yellow and red cards for social violations — everything from wearing flip-flops on the dirty streets of NYC to sneakily Instagramming pictures of strangers to lying about being Mario (yes, as in Super Mario... watch the video, you'll see). Generally, the folks the ref cites with violations are game to play along with him (he even gets a subway car singalong going with one group he talks to), but one woman is not amused by his antics. "You're not good at yelling at people," she tells him. I didn't know that was a bad thing? The ref in question is actually comedian Yoni Lotan, a New York-based writer and actor, and even though I know he made the video as a joke, I kind of wish handing out yellow cards in day-to-day life was a socially acceptable thing. Unwanted flirting? Yellow card. Close talkers? Yellow card. People who talk during movies? Immediate yellow card. It would be even more awesome to give yellow cards out to celebrities who need to get it together. Let's be real, some of them desperately need a life referee to blow the whistle on their behavior. Here are some celebs who seriously need a referee to intervene. He may have only gotten a misdemeanor for the infamous egging incident, but the Biebs really needs a yellow card and a whistle blown on his recent irresponsible behavior. For not writing fast enough! Sorry, but we're getting impatient over here! Give it up, Thicke, but you and Paula Patton are never, ever, ever getting back together. Maybe no amount of overly dramatic videos will ever help; maybe she just doesn't want to be with a guy who makes music that glorifies dubious consent? You don't publish lies about George Clooney or his family and get away with it, Daily Mail. Just... just stop talking, Gary Oldman. Her reaction to the rumors of Rosie O'Donnell re-joining The View was anything but classy. Flagged for being too perfect, especially because I can't think of a single cuter thing in the world than Ryan Gosling as a dad. Check out the Social Referee video below!